This is the first year that I am not spending Christmas in Wisconsin. My in-laws are coming in from Japan tomorrow, so we decided it made sense for us to stay put in Houston and, y’know, clean the house. This is the second year in a row that Christmas is…different. Last year my parents spent Christmas by themselves in Atlanta, where they were seeking treatment for my dad’s cancer, while my brothers, my husband, and I had Christmas in Wisconsin. Not only was the family not together for Christmas, but we all kind of knew that it would probably be my dad’s last. And of course, this year is the first one without my dad. And while this Christmas doesn’t have the same dark mood as last, and I am very much looking forward to seeing my in-laws, I still wanted to do something that would let us all be together, if only symbolically. 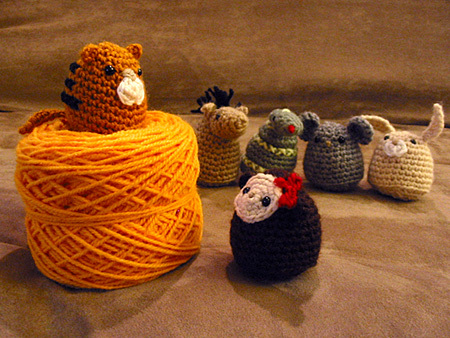 So I made Chinese Zodiac amigurumi. The front two are me (monkey) and my husband (rabbit). The back row, from left to right: my dad (horse), my mom (snake), and my two brothers (rat and tiger). Of course I decided to do this on December 20. Plan ahead for holiday crafting? What’s that? After one solid day of doing almost nothing but crochet, I just had the tiger left to do. And I discovered that the best color I had was…Cheetos Orange. No medium browns, not even a red in the right yarn weight. Just Cheetos Orange. I tried to make a tiger in Cheetos Orange. It made my eyes hurt. And there are no yarn shops open at midnight on Sunday. So I made a quick trip to Big Box Craft Store for some Wool-Ease after work Monday night (tried the LYS first but it was closed), finished the tiger, dropped everybody into a box and posted it Priority Mail on Tuesday morning. Miracle of miracles, they arrived in Wisconsin in time for Christmas. I got a call from my mom this morning and it sounds like they’re having a very merry Christmas over there. Though she does not believe me that my husband was born in the Year of the Rabbit. And we’re having a merry Christmas here too. So all is well. 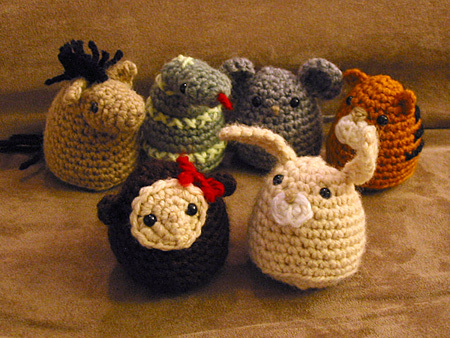 CogKnition posted this on December 25th, 2009 @ 2:37pm in Crochet, Finished Objects, Toys | Permalink to "All Together for Christmas"
The fast delivery is a Christmas miracle!